Lots of Disk System gamers and technical freaks wonder how they can find FDS disks which they can use to write new games. Nintendo licensed disks aren’t easy to get for cheap and pirate disks, though usually pretty inexpensive, can be somewhat elusive on auctions sites. What most people don’t know is that Nintendo modeled its disks after Maxell’s Quick Disks. The Quick Disks are the same size and design as the Nintendo disks with only one difference. Nintendo disks had Nintendo imprinted in the plastic at the top. Maxell disks don’t have this…but you can find creative ways to fix that problem. In the image below is a Maxell disk used to pirate Nintendo FDS games. The Chinese pirater of this disk used the label to stick a rectangular silver rod — only slightly thicker than a large paper clip — at the top of the disk to mimic Nintendo’s design. 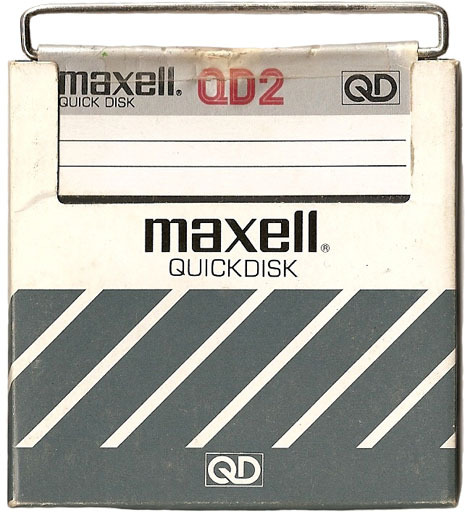 Maxell Quick Disks were among the first of it’s kind. In you 80s, you might remember the large and thin “floppy” disks. Those disk lost their attraction as companies came out with smaller and sturdier disks. Disks, like Quick Disks and slightly larger ones, were widely used until the end of the 1990s when CDs became more popular for data storage and transfer, as did flash drives. It might actually be easier for gamers to find pirated disks than searching for Maxell Quick Disks, but at least you now can keep an eye out for these. 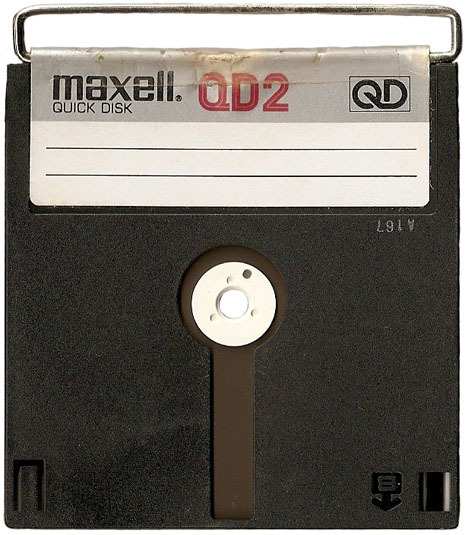 The Maxell Quick Disk with slight modification. A Quick Disk in its protective sleeve.